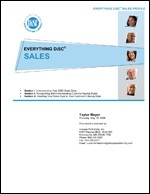 Everything DiSC® Sales helps you create quality, one-of-a-kind sales solutions that fit your needs and increases sales effectiveness using the power of DiSC. Combining an EPIC-based pre-work assessment, classroom training, all-new video, and post-training reinforcement, Everything DiSC Sales is a complete sales training experience. The new, research-validated 79-item EPIC assessment, creates an all-new 22-page personalized report that helps salespeople understand themselves, the customer, and their relationship. For the first time you can remove or rearrange profile pages, customize the profile title, or print selected sections. Everything DiSC Sales Profile is sold separately and can be used with the facilitation or with your own materials. The EPIC-based Everything DiSC Customer Interaction Map is an innovation in people-reading that allows you to extend the training and the learning to the real world when the customer needs it. The Customer Interaction Map gives salespeople a unique, personalized report that compares their style with an actual customer. One Everything DiSC Customer Interaction Map is included with each Everything DiSC Sales Profile. Six 50-minute modules of fully-scripted, engaging experiential and processing activities bring the profile and video to life. MS Word format allows you to create and save a custom solution for every session. Modular design makes it easy to fit any timeframe, from one-hour to full-day. More than 60 minutes of contemporary video with real-world, sales-specific customer interactions show how DiSC styles affect buying and selling. Pick and choose clips that fit your needs. Video can be used three ways: as standalone clips, integrated into the facilitation PowerPoint, or integrated into your custom PowerPoint. Everything DiSC Sales requires Windows XP with PowerPoint 2003 on a Pentium 4 or AMD Athlon (1.4GHz or faster) with 1GB of RAM. Facilitation, video, PowerPoint, and participant handouts come on a USB drive with ample space to save your customized programs in one spot. “DiSC”, “Everything DiSC”, and “Everything DiSC Sales” are registered trademarks of John Wiley & Sons, Inc.